ICYMI: We’d like to present a recap of some of the community policing initiatives from the Speedway Police Department during 2016 in this 4-part series. Our website and social media accounts started as “Speedway Neighborhood Watch,” which is just one of Speedway PD’s community policing programs. But we share so many things relating to the department’s other community policing programs (Speedway Police Citizens Academy, Volunteers in Policing, Student Academy, D.A.R.E.) that we wanted our website and social media Facebook and Twitter accounts to reflect all of those great programs! (Note: the main Speedway Police Department Facebook and Twitter accounts have not changed; we share common posts between accounts, but the Speedway PD accounts offer a wide variety of additional useful information this page doesn’t typically cover, including traffic, street closures, race information, etc.). Coppertree Apartments held a “Back to School” event for its residents and children on Sunday, July 31st. 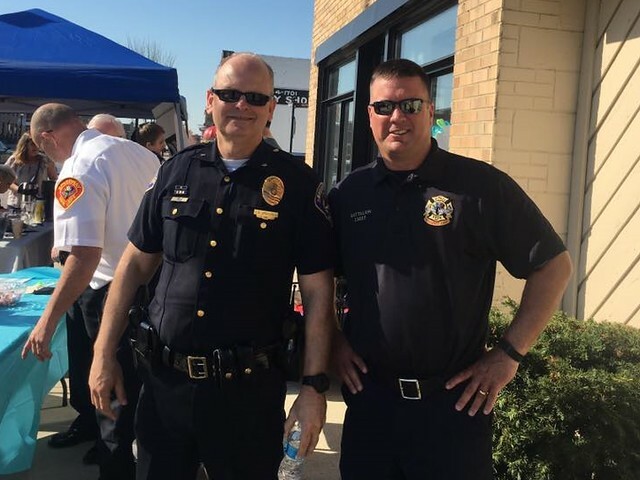 The Speedway Police and Fire Departments, along with members of the Speedway Volunteers in Policing program, were in attendance – great food, music and fun…a good time was had by all! In Dallas, Texas in early July, a suspect ambushed and fired upon a group of police officers, killing five and injuring nine others. The Speedway Police Department is very grateful and appreciative to so many individuals and businesses in our community that have shown support and caring to our officers in a variety of ways. 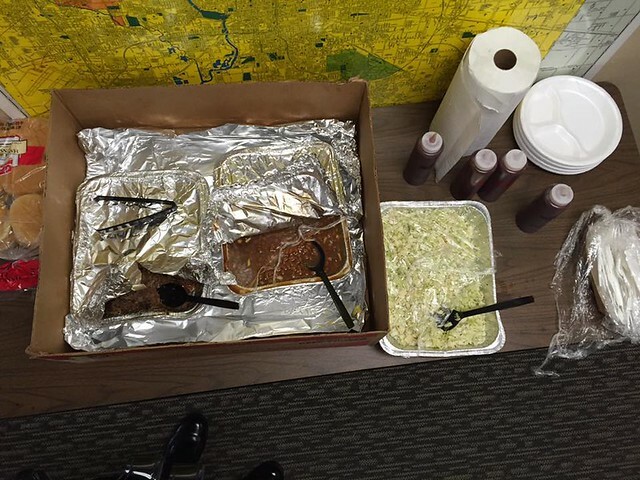 Dave and Marcia of Main Street’s Barbecue and Bourbon provided meals for shifts. Several food items came in for a couple of weeks to support our officers. 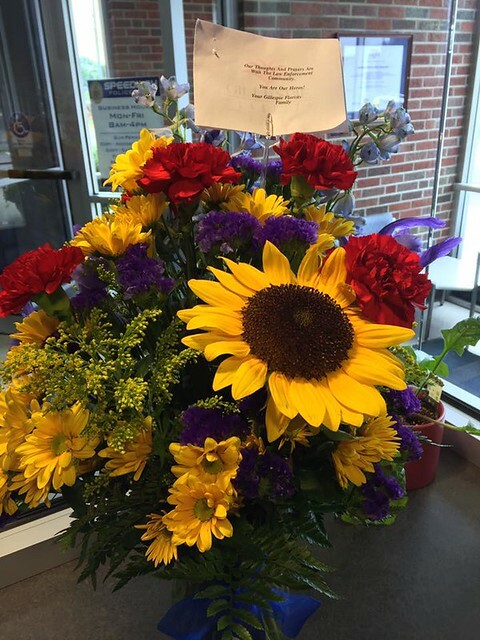 Gillespie Florists provided a beautiful flower arrangement. 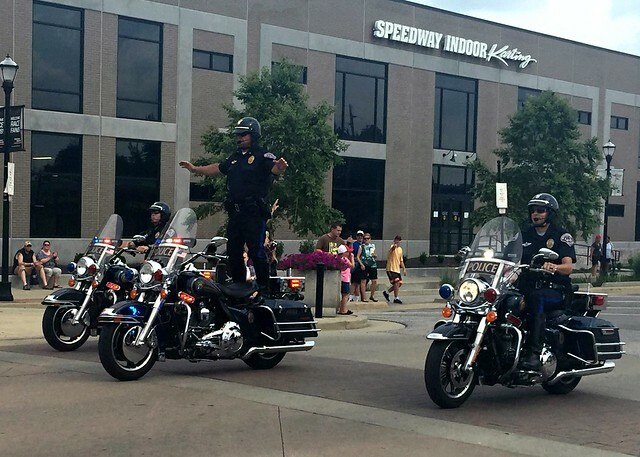 The Speedway PD Motorcycle team entertains the growing crowd on Main Street for the NASCAR Hauler parade. In addition, VIPs provide assistance to SPD Officers for the event’s traffic and security needs. 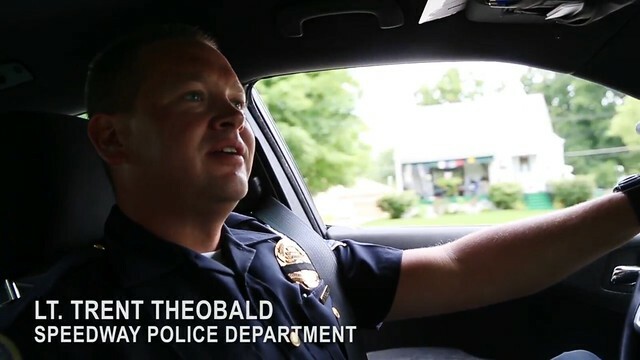 Lt. Trent Theobald was featured in this video from IndyStar: Policing to Bridge Gaps in Speedway. Congratulations to Sgt. Mark Morgan. 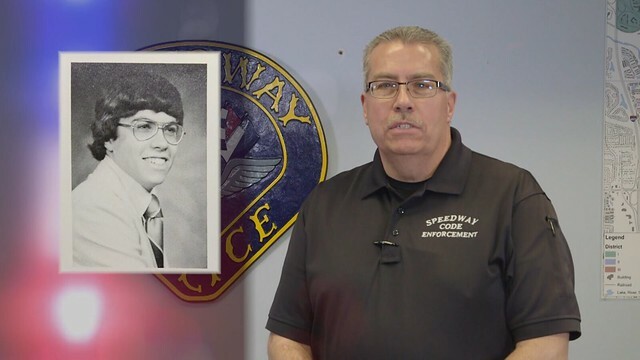 This month he has been with the Speedway Police Department for 35 years – many thanks for your service! 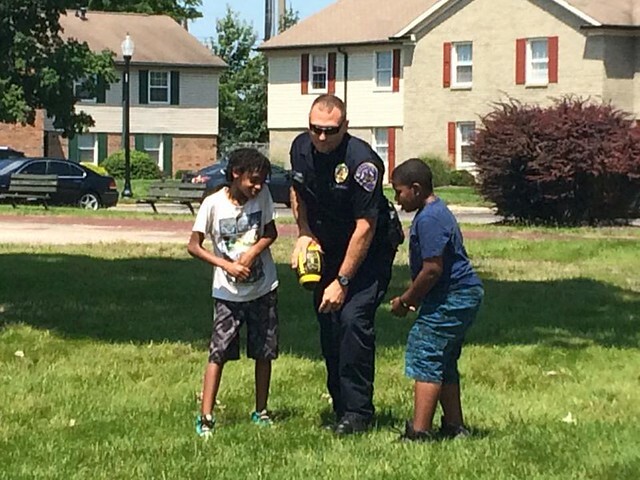 Speedway PD Officer Alex Redding takes some time on a nice summer day to have fun and play a little football with some young residents of Coppertree Apartments before school starts next week (already?)! 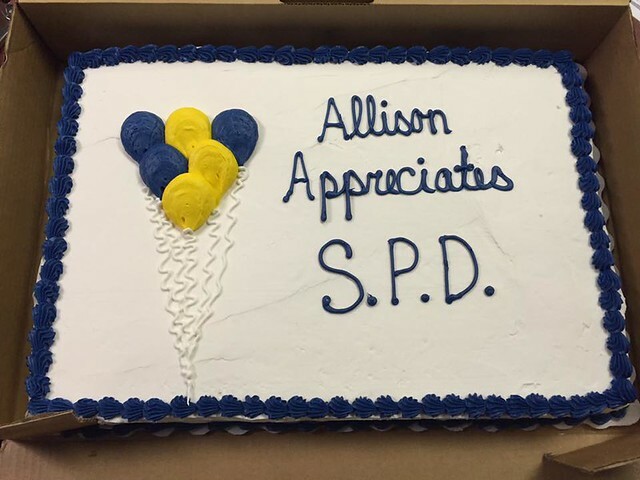 In continuing to offer moral support and community partnership, Allison Transmission recognizes SPD with a cake to show their appreciation and thanks. Tier 2 members of the Volunteers in Policing program have started park monitoring/patrol at Meadowood and Leonard Parks, at other times subject to volunteer availability. Earlier in the summer, they started working at the concert series, but they will also be present in the parks on various afternoons, evenings, and weekends. If you shop at Kroger and would like to help support the Speedway PD Citizens Academy Alumni Association, please consider registering for Kroger’s Community Rewards. After registering, all you have to do is swipe your Kroger card when you shop and the SPCAAA will get a portion as a donation! See this link for details, thank you! 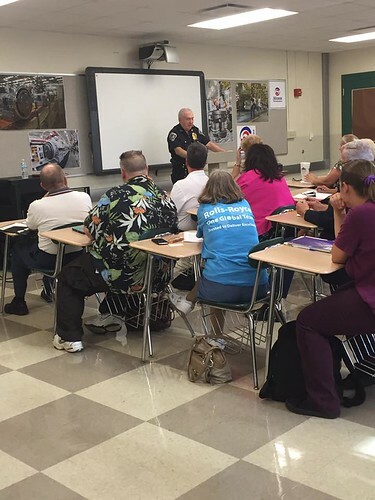 The 7th Speedway Police Citizens Academy Class started in late August. Citizens Academy classes are a great way for residents to get to know the police officers that serve the community, learn more about what they do and why, and build positive relationships! The 12 week course features a variety of exciting lectures and hands on classes taught primarily by Speedway Police Officers, as well as some other public safety partners. Graduates choosing to get involved and volunteer with the department can join the Speedway Police Citizens Academy Alumni Association and when offered, continue to the Volunteers in Policing program. SPD day shift thanked District 2 neighbors for helping look for a young autistic boy that walked away from his home today. We are proud to serve a community that stops whatever they’re doing to help a neighbor in need. He made it safely home thanks to caring neighbors. 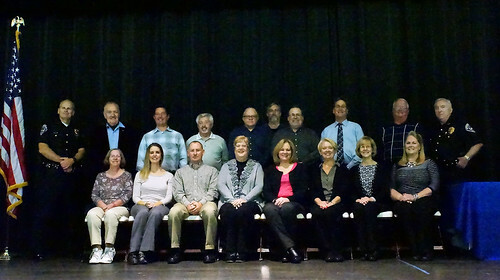 The department started training a second group of Citizens Academy Alumni as part of the VIP Tier 2 program. 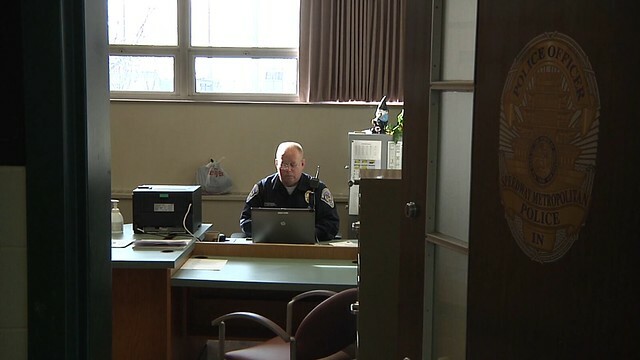 Upon graduation, they will join the other Tier 2 graduates and assist the department with traffic direction and control at various events in town, as well as park monitoring and patrol. 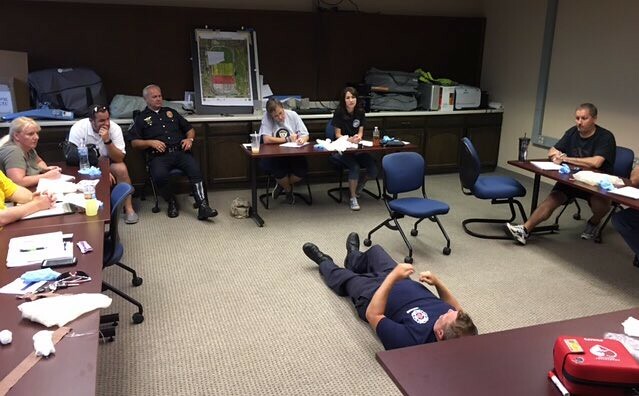 Below, Tier 2 VIPs receive First Aid and CPR training from the Speedway Fire Department as part of their training. 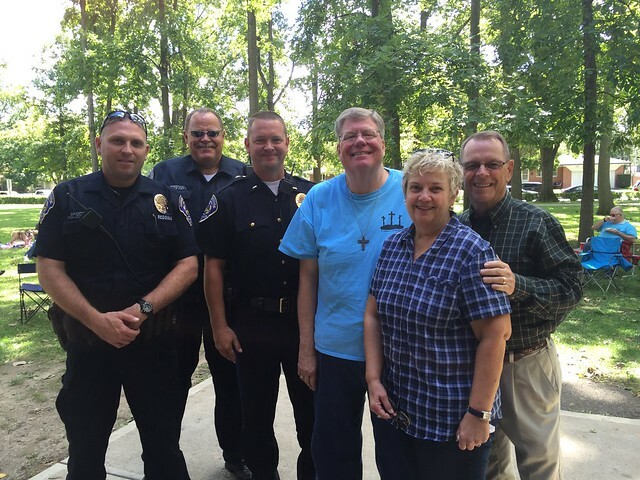 On September 11th, St Andrews Lutheran Church recognized Speedway officers at a pitch-in at Meadowood Park. 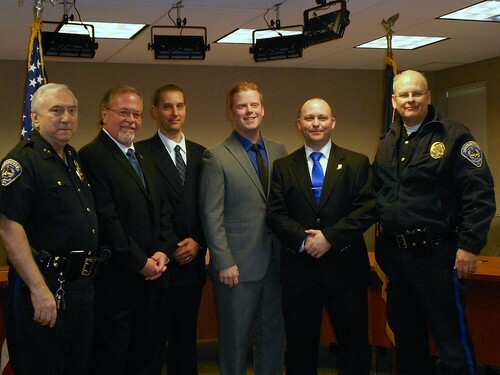 Below, Officers Alex Redding, Mike Clupper & Lt. Trent Theobald along with Chaplains Holly Hardsaw and Rick Kassel. 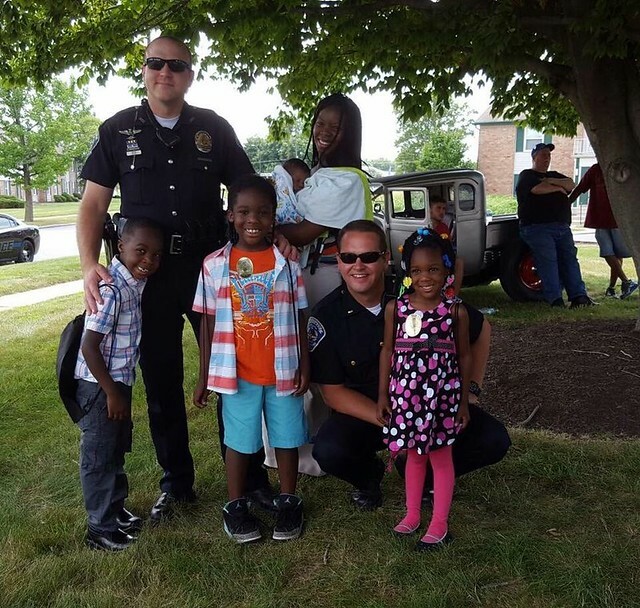 Join us next week for Part 4 of our Speedway Community-Police Partnerships: 2016 Year in Review. A police standoff with a suspect who had been living in his van in a Speedway neighborhood stresses the importance of promptly reporting suspicious activity to local law enforcement. The Speedway community supports officers on scene with food & beverages. 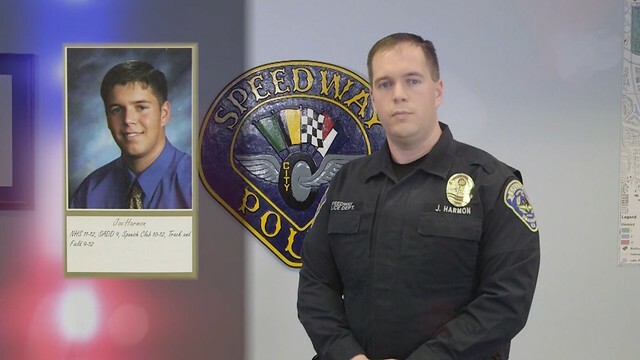 Speedway Police Officers and Firefighters who graduated from Speedway schools are featured in “Speedway Hometown Heroes” video. 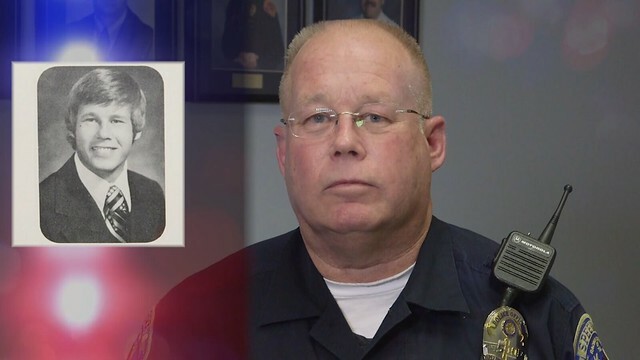 Watch below to learn more about the Speedway Fire Department’s Capt. JP Mathews, Pvt. Eric Emerson Jr., Engineer/Arson Investigator Pete Foltz, Battalion Chief Jeff Hartman, Capt. Brian Wyatt, Lt. Jim Otte, Engineer Aaron Steffy. As they talked about their school teachers who provided positive influences in their life, a nod was given to Speedway High School teacher Becky Kilgore, a graduate of the Speedway Police Citizens Academy and also of the Volunteers in Policing program, Tier 2. Becky can often be seen around town, assisting SPD with traffic direction and control at various events. 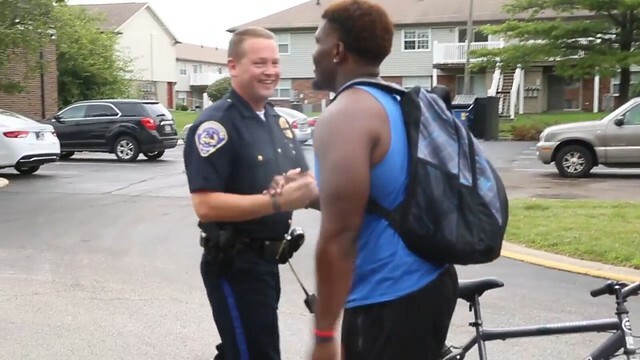 The video then features Speedway Police officers, and that the type of service and dedication to the safety and security of every resident is part of a culture and commitment that all Speedway police take seriously. Speaking of their upbringing and education from Speedway schools, they all agreed that they were taught to have pride and respect for our community. The video highlights the fact that in Speedway, “community policing” is not just a phrase, it’s being there for their neighbors. Speedway Police live it every day, whether their ability to be anywhere in two minutes, helping with school crossings, and talking to kids. Serving the community and making it a better place! 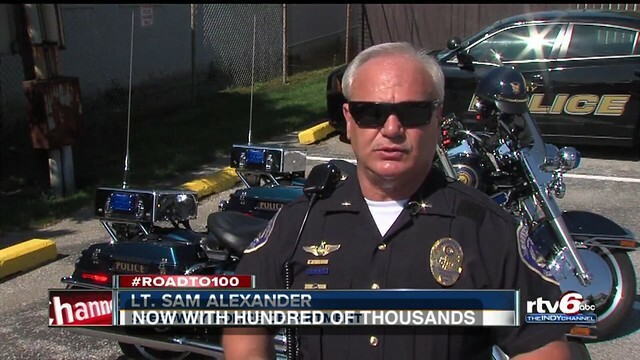 Below, Code Enforcement Officer Joe Kramer, Sgt. Rod Ferguson, SRO Mark Jones and Sgt. Robert Dine share their Speedway High School Yearbooks. Speedway Hometown Heroes from CIESC on Vimeo. Speedway Police and volunteers from the Citizens Academy and Volunteers in Policing programs assist Central Indiana Crimestoppers for the first of two biannual “Shred-it Days.” Proceeds from donations assist in crime solving efforts, by contributing to the reward fund. Congratulations to Sgt. Jeff Griffin on serving for 25 years as a Reserve Officer with the Speedway Police Department. In addition, the department welcomed three new Reserve Officers, Chris Pope, Eric Scheffel, and Nick Sturgeon. 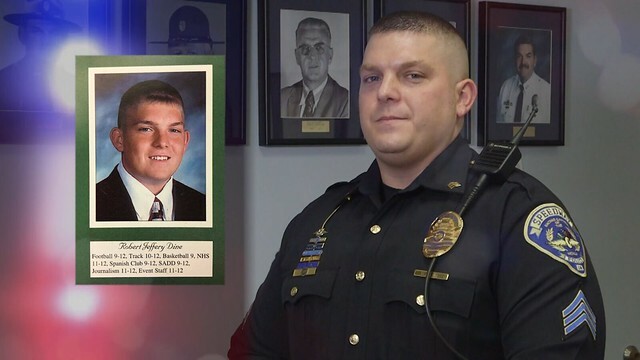 Officer Pope was a graduate of the Speedway Police Citizens Academy, and joined the Volunteers in Policing program, moving up to the Tier 2 level before deciding to go straight to the Reserve Division. Congratulations to all, and thank you for your service! 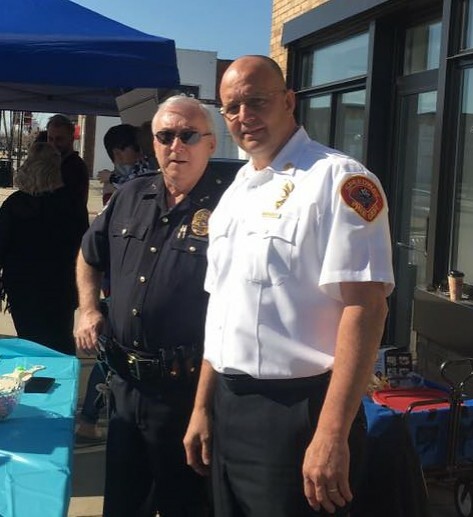 Speedway Police Chief Jim Campbell (left) and Speedway Fire Chief Bob Fishburn. 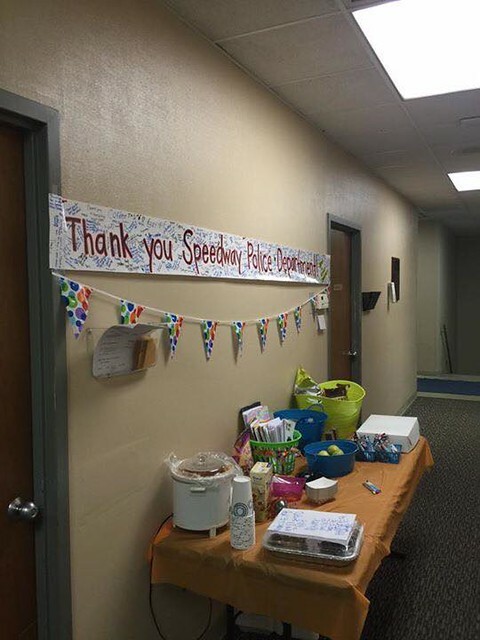 Many thanks to SPD wives, Citizens Academy Alumni, and Speedway residents for so many wonderful treats and surprises during National Police Week! The D.A.R.E. 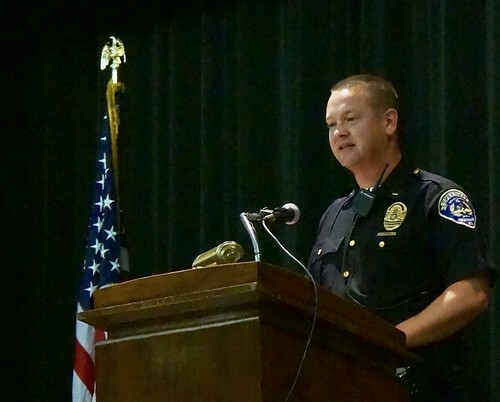 Graduation ceremony was officiated by Lt. Jim Thiele, one of the program’s instructors, along with Det. Lauren Roemke and Det. 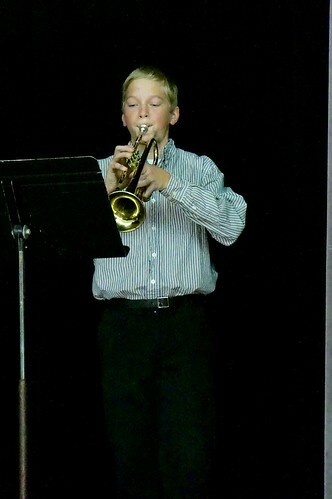 Kyle Hodges. 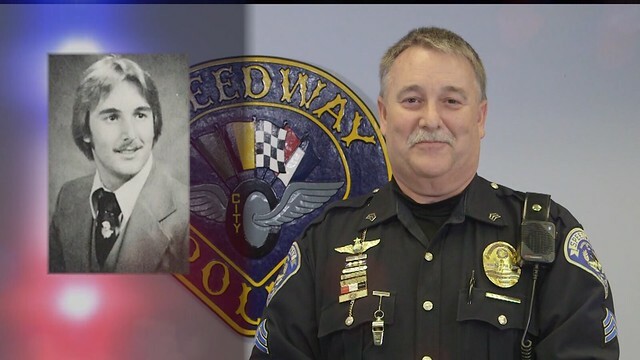 Lt. Thiele offered a history of the program, both nationally and in Speedway, where it has been offered for 26 years. He explains that the program is not just about teaching kids of the dangers of drugs and gangs; the majority of the time is spent talking about making good choices and the consequences of their actions. The police officers, along with the teachers and parents, getting the kids to think about those things, helps the kids be successful in life, which is the goal. Retired Speedway High School principal and current school Board member Tom Smith also spoke, emphasizing to the students the importance of the world’s need for good people, hardworking, loyal and on time, and doing the best one can. Opening the presentation of graduation certificates, Allison Elementary students and principal Jay Bedwell presented the Speedway Police Department with a “thank you” banner, commending them for all they do for the students and the town. CA Alumni are doing a lot of great work to support the department and bridge the gap by building positive community-police relationships. VIP Dana Taylor also has taken the next step and joined the Volunteers in Policing (VIP) program. She and other Tier 2 VIPs assist SPD with event traffic and security at various town events, including the Mini Marathon, Angie’s List Grand Prix, Festival on Main, Racing Through the Decades Pub Crawl, and race day. Thanks to all for your dedication and service to Speedway! 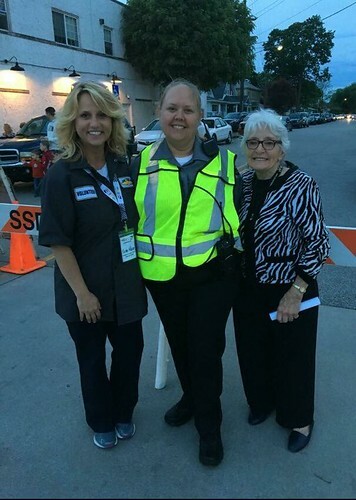 Speedway PD Citizens Academy Alumni at the Festival on Main (L to R) – State Rep. Karlee Macer, VIP Dana Taylor, and Marilyn Conner. 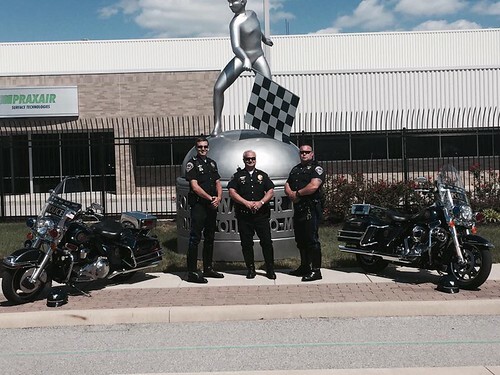 Lt. Sam Alexander (center) along with Officers Jacob McAtee (left) and Jereme Howery (right) of SPD Motorcycle Division pose for a photo along Main Street with a replica Borg Warner trophy. 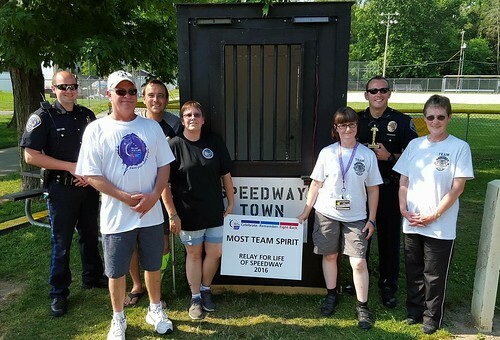 The Speedway Police Department, Speedway Police Citizens Academy Alumni/VIPs, and Marion County Prosecutor’s Office formed “Team Dragnet – Just the Facts, Ma’am,” for the Speedway Relay for Life events. Our team raised funds for the fight against cancer by selling donuts, cookies, walking tacos & of course, running the Jail & Bail. Thanks to Relay For Life of Speedway for honoring us with Most Team Spirit and Best Costume Awards to Speedway Officers Keegan Rupenthal and Nathan Shipley! We had a great time and we’re glad how much fun everyone has with the Jail & Bail! We were VERY busy and look forward to more fun next year! Speedway Police held another Neighborhood Watch Meeting on June 23. The format was an open question and answer session held with Sgt. Mirantha Wilson and Officer Mat Turpin. Residents were very engaged, asking a variety of great questions. Speedway Police Officers visited St. Christopher’s School students during vacation bible school. 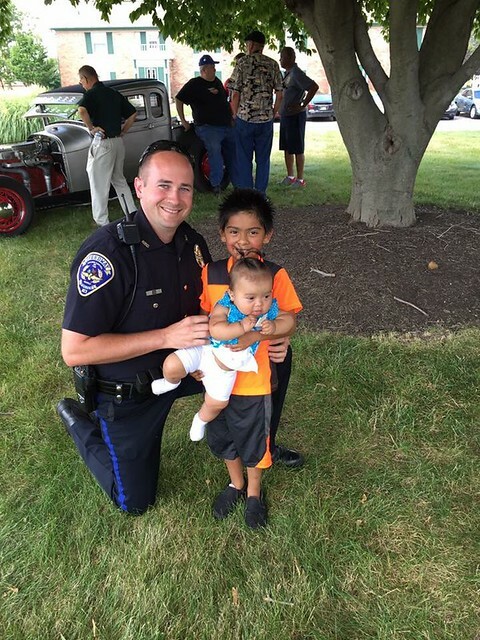 Here, Officer Nathan Shipley shows children his police car. 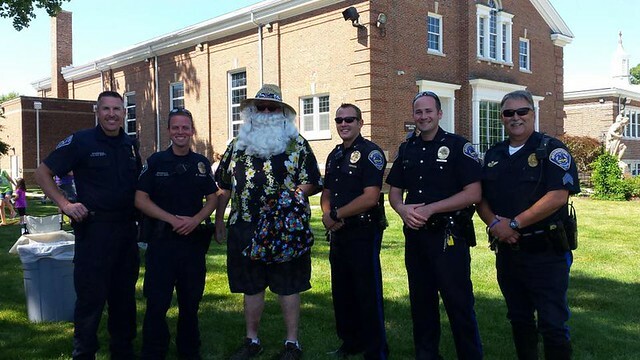 Below, dayshift officers pose with Summer Santa at the last day of vacation bible school at St. Christopher church. 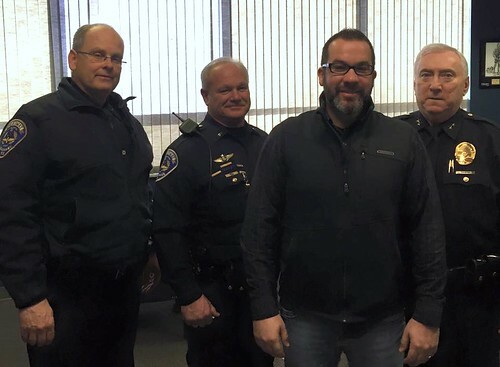 Left to Right: Officers Mike Marsteller, Pat Hammel, Keegan Rupenthal, Nathan Shipley, and Sgt. Rod Ferguson. Join us next week for Part 3 of our Speedway Community-Police Partnerships: 2016 Year in Review. January started out with the first of several Neighborhood Watch meetings for the year, but we had a great turnout despite the cold. 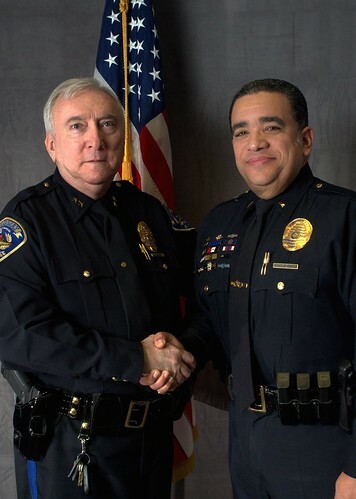 Below, Chief Jim Campbell congratulates Lt. Alex Rodriguez on celebrating 20 years serving the community with SPD. Joe Killion obtained the rank of Lieutenant within the Reserve Division. Lt. Killion also coordinates the department’s Volunteers in Policing program. 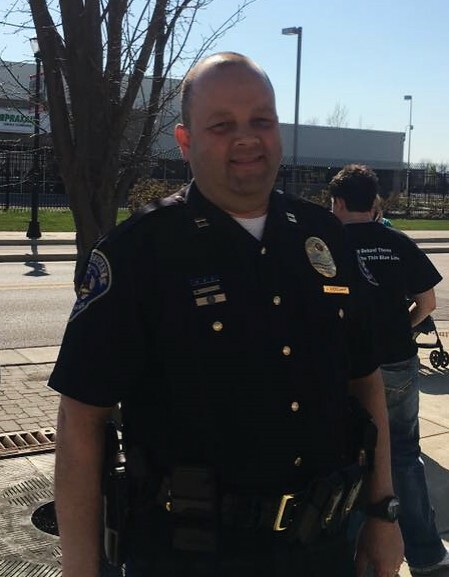 In February, the Speedway State of the Town highlights Community Police Partnerships, including the growth of the Speedway Police Citizens Academy since 2011 and the formation of the Volunteers in Policing program in 2015, along with continued positive interactions between police officers and residents. This month saw the Volunteers in Policing program continue to expand, with the recruitment of a second Tier 1 Class. Lt. Sam Alexander, the VIP Program Supervisor, teaches the class. 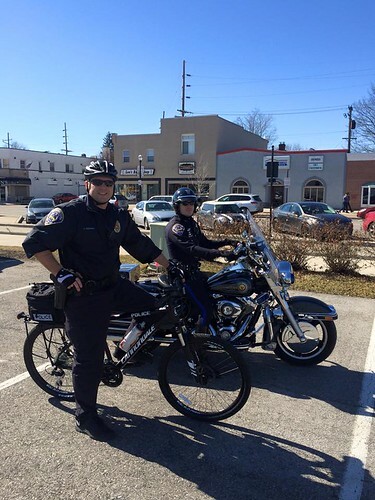 Our area experienced a nice warmup for two February weekends, allowing for Officer Alex Redding (bicycle) and Officer Keegan Rupenthal (motorcycle) to enjoy patrolling on Main Street. Friday, February 19th marked the start of the countdown of 100 days to the 100th running of the Indy 500. Indianapolis Mayor Joe Hogsett and Secretary of State Connie Lawson declared Friday the “100th Running of Indianapolis 500 Countdown Day.” Special bottles of milk signed by IndyCar drivers were distributed throughout the city. 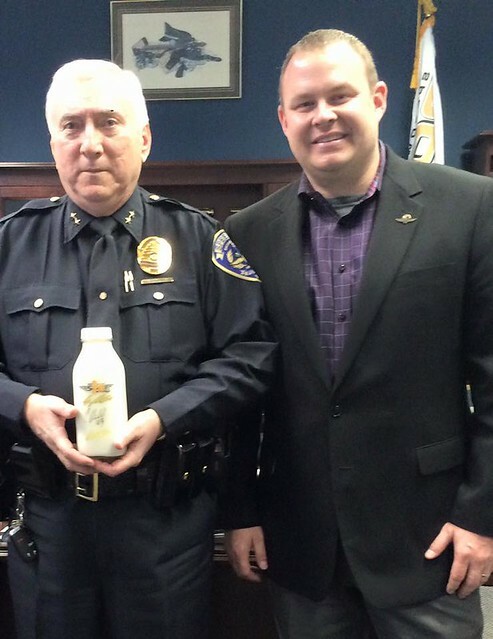 Below, Senior Director of IMS Facility Management and Planning Dave Shaw presents SPD Chief Jim Campbell with one of the milk bottles. 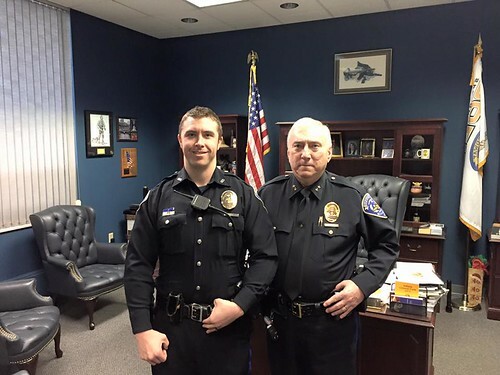 Congratulations were in order for two Speedway Police Officers, Mat Turpin and Robert Fekkes, both celebrating ten years with the Speedway Police Department! 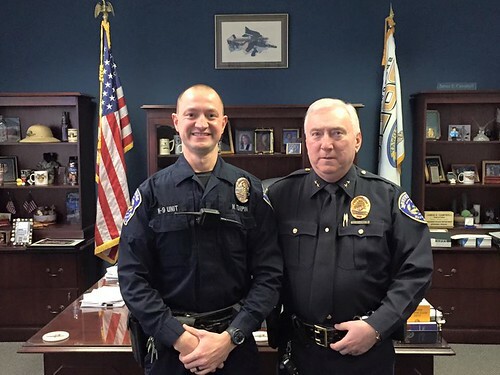 Below: Officer / K9 handler Mat Turpin at left with Chief Jim Campbell. 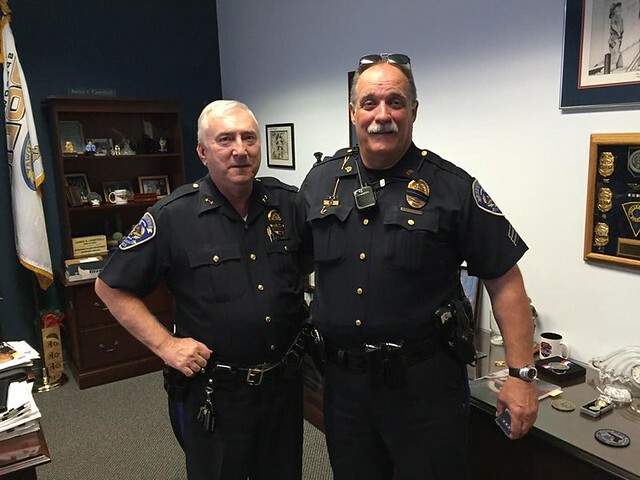 Below: Officer Robert Fekkes at left with Chief Jim Campbell. 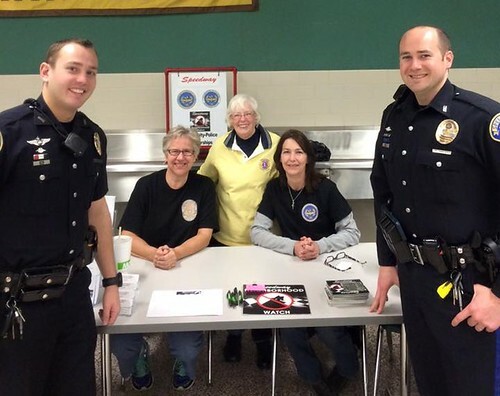 SPD Officers Keegan Rupenthal (left) and Nathan Shipley (right) join Speedway Police Citizens Academy Alumni / VIP Becky, Elizabeth, and Monica at the Speedway Lions Club Pancake Breakfast. Attending events like this is one way the SPCAAA reaches out to the community to promote awareness of the department’s various community policing programs and foster positive community-police relationships. 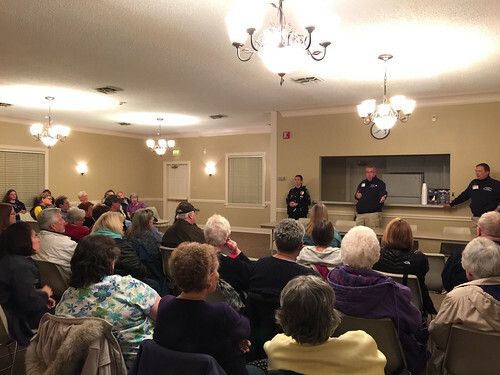 Later in the month, we had an excellent turnout for the Speedway Police Department for our next Neighborhood Watch meeting. Sgt. Mirantha Wilson introduced Joe Kramer and John Merritt of the Code Enforcement Division of the Speedway Police Department. 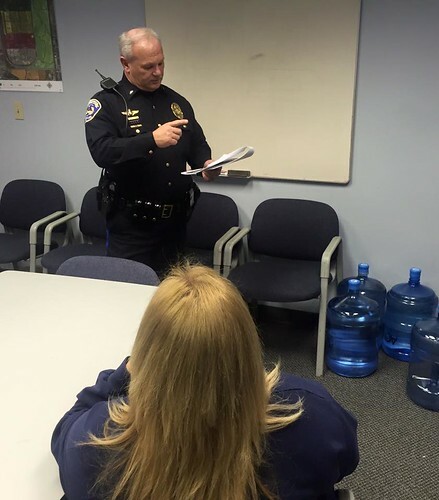 Officer Kramer explained to the residents of several concepts and duties of the Code Enforcement Division, while Officer Merritt discussed building permits and related codes. 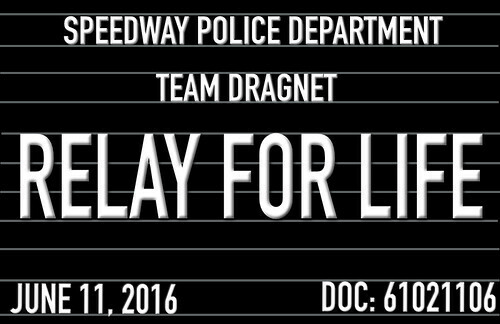 SPD and Citizens Academy Alumni will participate in the Speedway Relay for Life event this June as “Team Dragnet: Just the Facts, Ma’am”. 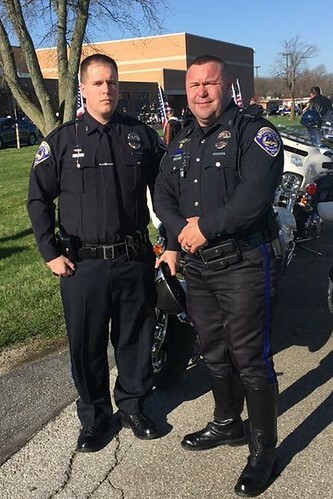 SPD Officers Joe Harmon & Jereme Howery attend the funeral of Howard County Deputy Sheriff Carl Koontz, shot in the line of duty during service of an arrest warrant. Through the use of social media, the Speedway community assists SPD make a quick arrest of a suspect in the theft from former IndyCar driver Sarah Fisher’s Main Street business, Speedway Indoor Karting. 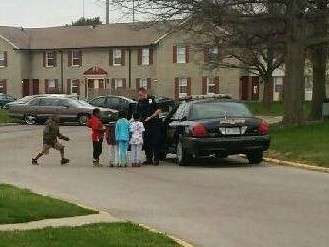 Below, Officer Joe Harmon visits with kids at Coppertree Apartments on a warm March evening. Join us next week for Part 2 of our Speedway Community-Police Partnerships: 2016 Year in Review. 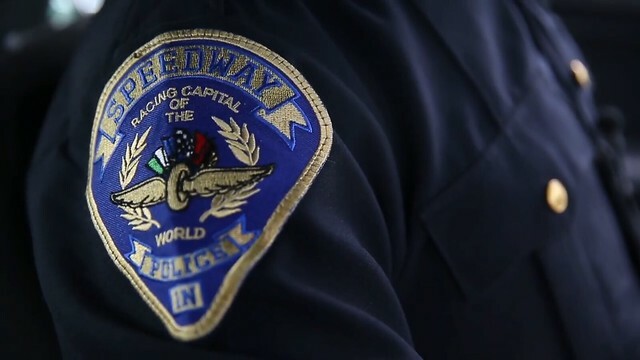 Video published by Speedway Cable of the recent graduation of the Speedway Police Department’s 7th Citizens Academy Class and 2nd Tier 2 Volunteers in Policing Class. On November 16, 2016, the Speedway Police Department held a graduation ceremony for its 7th Citizens Academy class, and the 2nd class of its Tier 2 Volunteers in Policing (VIP) program. 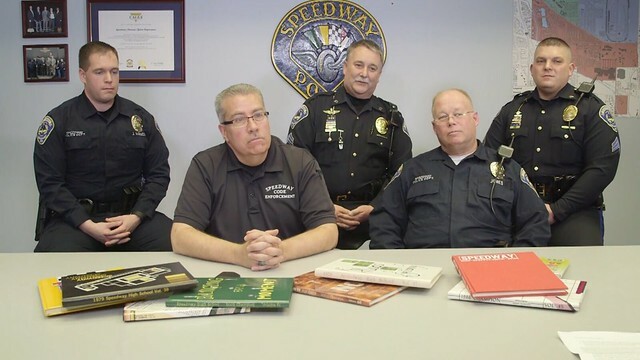 Both programs are part of the Speedway Police Department’s ongoing community policing efforts, in which the department encourages Speedway residents and business owners to learn more about their operations and the challenges faced by officers as they do their jobs. That increased knowledge helps residents to better understand situations officers encounter, how they handle them, as well as the tools and resources available, which in turn, helps improve community-police relationships. 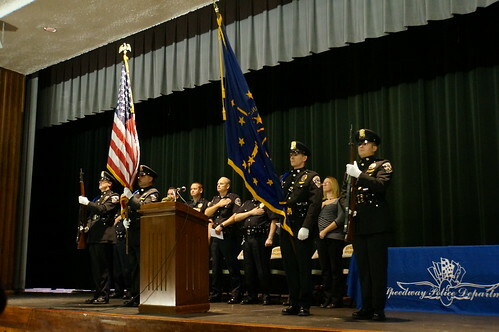 The graduation ceremony opened with the Presentation of Colors by the Speedway Police Department Honor Guard and National Anthem played on the trumpet by Speedway High School student Zach Merrill. 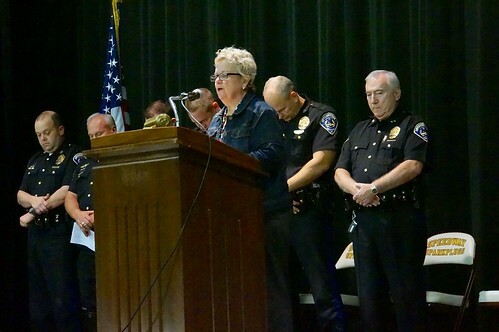 Speedway Police Department Chaplain Holly Hardsaw gave the invocation. Lt. Trent Theobald, Police Coordinator of the Citizens Academy offered his opening remarks, thanking the students for their interest in the program and welcoming them to the Speedway Police Department family. 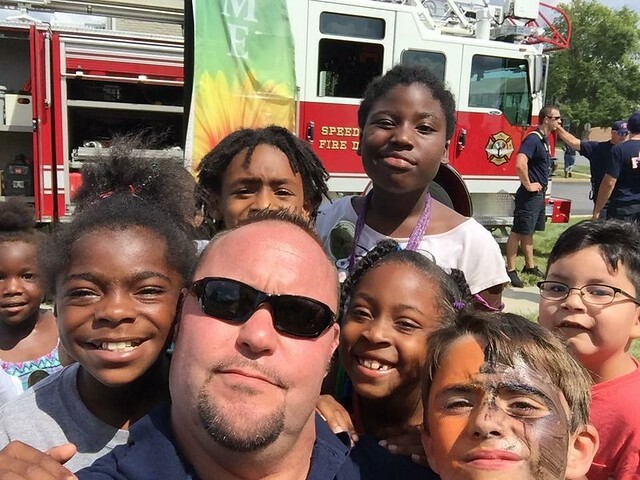 He stressed that this experience was only the beginning, not the end – as the department offers many ways for them to volunteer to serve the department and the community. 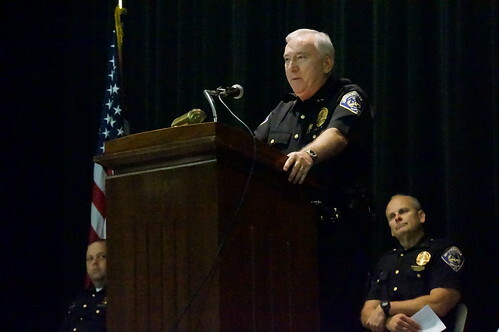 Speedway Police Chief Jim Campbell gave his address to the students, reinforcing the concept of the community and police working together. The Citizens Academy program is an excellent way to build that partnership – it is the foundation for a continuing relationship between graduates and the department as they can continue on to the Speedway Police Citizens Academy Alumni Association and Volunteers in Policing programs, which work to serve the residents of Speedway. The Citizens Academy graduates were recognized and presented with their certificates by Program Coordinator Sarah Edie and Chief Campbell. Next, Reserve Lt. Joe Killion, the Program Coordinator for the Volunteers in Policing program, gave his remarks regarding the Tier 2 program, noting that the Tier 2 graduates are examples of a continued level of volunteer service that Citizens Academy students can pursue. He thanked the graduates for their commitment and sacrifice as well their families for supporting them in their community service. The seven Tier 2 graduates will join seven Tier 2 VIPs who graduated in last year’s inaugural class. Tier 2 VIPs provide necessary staffing to the department by assisting with security, traffic direction and control at various community events, park monitoring and patrol, and other duties as needed. Lt. Sam Alexander, VIP Program Supervisor, joined Lt. Killion for the recognition and presentation of certificates for the Tier 2 graduates by Chief Jim Campbell. Also on stage to congratulate the students were Assistant Chief Charles Upchurch and Captain Jason Dierdorff. Closing remarks and benediction were given by Lt. Theobald and Chaplain Hardsaw, respectively and a reception followed in the cafeteria. We would like to congratulate and welcome all of the students of the 7th Speedway Police Citizens Academy and Tier 2 of the Volunteers in Policing program! The Speedway Police Department and the residents of Speedway continue to build upon positive relationships and we encourage every resident and business owner to consider joining a future class. See www.SpeedwayCommunityPolicing.com/speedway-police-citizens-academy/ for details on how you can apply for next year’s class. Over the next 10 weeks, we will be presenting a series of blog posts relating the experiences of several current students attending the 7th Speedway Police Citizens Academy. We hope you enjoy reading about their experiences and will consider joining a future class. Applications are accepted year round, on a first come basis. Click here for more information and an application. Students of the 7th Speedway Police Department Citizens Academy attended their first class on Wednesday, August 31, 2016. We share our thanks to Lt. Trent Theobald, Sarah Edie, Chief Jim Campbell, and Assistant Chief Upchurch for taking their time to attend and share information regarding their positions. We learned about the history of policing going back to the Roman empire as well as the history of the Town of Speedway beginning in 1926 with 500 residents. We were proud to hear of our Speedway Police Department receiving CALEA Accreditation, of which only 11% of police departments in the United States are approved. 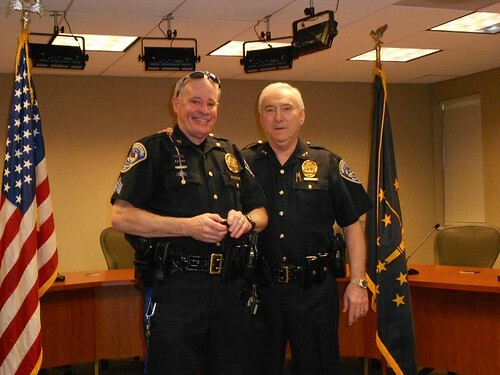 What an honor for our SPD! We also learned how updated technology has enabled our officers in their daily duties, that a citizen’s arrest is legal only for a felon, not a misdemeanor, and how important it is that the residents of Speedway work with our officers for community policing each and every day. We are looking forward to our future classes with their wide range of topics from gangs and drugs to SWAT and K9 in order for us to graduate this class and become VIPs (Volunteers in Policing). Again, we thank Chief Campbell for initiating these programs. 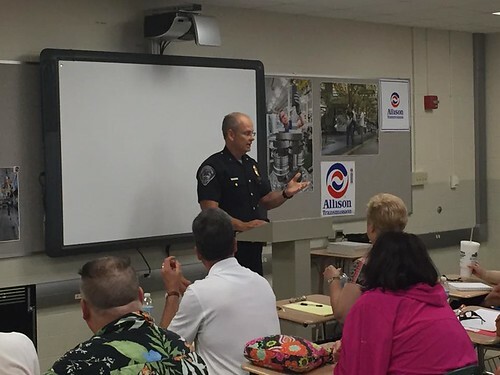 Lt. Theobald once again opened last evening’s class with entertaining stories as he distributed the syllabus and ride-along sign up sheet. The class enthusiastically responded to the upcoming classes and opportunity to ride with an SPD officer. Commissioner Phill Smith was in attendance, and provided a brief synopsis of his career and current position, including some interesting facts throughout the different positions he held. Detective Chris Ristuccia kept the attention of the class for 2-1/2 hours with his informative presentations regarding gang and drug awareness in Speedway. We are proud to say that Speedway does not have any gangs established due to the hard work and sacrifice of our officers. Det. Ristuccia discussed the history of gangs, the reasons young people join them (to feel like they belong to something or someone for love and money, etc. ), the types of membership and stages of gang membership and activity, ranging from low level misdemeanors to violent crimes. We learned the names of different gangs, their colors, and the meaning of their signs/graffiti. 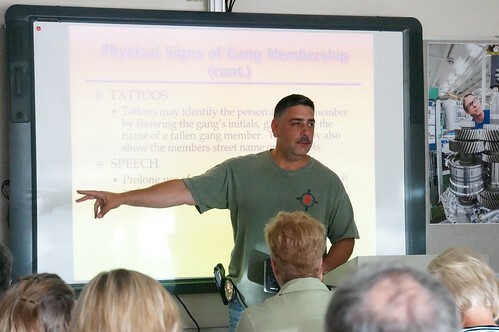 The class was amazed at the overwhelming number of gangs & members in Indianapolis – 398 active gangs with over 2700 members. Det. Ristuccia also presented, in detail, the horrific problem heroin is currently causing. We learned heroin is now being distributed at college parties in the form of a pill (light blue) without the kids knowing it’s heroin, causing them to become addicted, ruining their lives, along with their families lives, searching for that “high” feeling that never is achieved. It’s a desperate time calling for desperate measures to curtail this activity. Heroin is “everybody’s” drug – there is no status, all the way from the homeless to high-level professionals. Det. Ristuccia also shared the steps which occur during a narcotics investigation and our officers’ concern in persuading kids to make better life choices. We also learned about other numerous types of drugs and the harm they do, from marijuana and inhalers to meth and cocaine. There currently are 22.5 MILLION drug users from the age of 12 and older. It’s astounding to hear these statics, but we are so proud of our Speedway Police Department working diligently each and every day to keep our city free from gangs and heavy drug use. The class is grateful to Detective Ristuccia for his time in presenting these topics to us. STAY TUNED: The next two classes will be on EVO – Emergency Vehicle Operations; students will have class time learning about various aspects of operating a police vehicle and traffic stops, then will take that knowledge out to the Indiana Law Enforcement Academy where they will drive a police car on a road course and conduct mock traffic stops. The website Speedway Neighborhood Watch, along with its social media accounts on Facebook, Twitter, Flickr, and YouTube (see links at right under “Connect with Us”) have all been redesigned and rebranded as “Speedway Community Policing” to reflect and highlight all of the excellent community policing programs of the Speedway Police Department, in addition to Neighborhood Watch. While this site (and our social media) will highlight those programs as well as safety, neighborhood watch news and info, please also be sure to continue to follow the main Speedway Police Department accounts on social media (see links here) for important updates related to traffic, race event information, street closures & repairs, etc. Applications Being Accepted for 7th SPD Citizens Academy! Are you interested in learning about the Speedway Police Department and what it takes for officers to do their jobs? Here’s your chance to learn all about K-9, fingerprinting techniques, crime scene investigations, go on a ride along, and much more over this 12-week program! Afterward, if you choose, there are various opportunities to get involved and volunteer for the department as well! 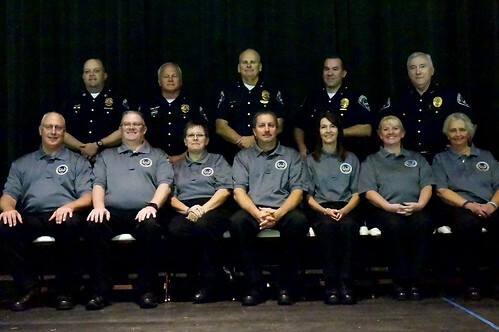 The 7th Speedway Police Citizens Academy Class will start on Wednesday, August 31, 2016. Applications are currently being accepted for approximately 5 remaining spots in the class on a first come, first served basis until the class is filled. 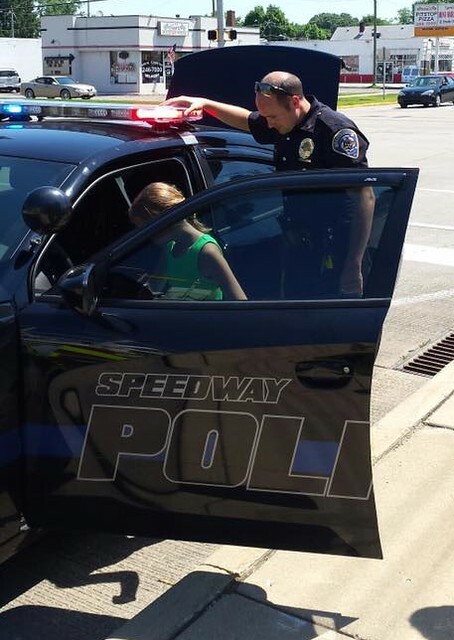 For more information on the Speedway Police Citizens Academy program, click here. The Speedway Police Department and Speedway Police Citizens Academy Alumni Association (SPCAAA) will participate in this year’s Speedway Relay for Life event, to be held for 24 hours from 10AM on June 11, 2016. The overall theme for this year’s Relay for Life event is “Relaywood” and each participating team will feature a different movie theme. 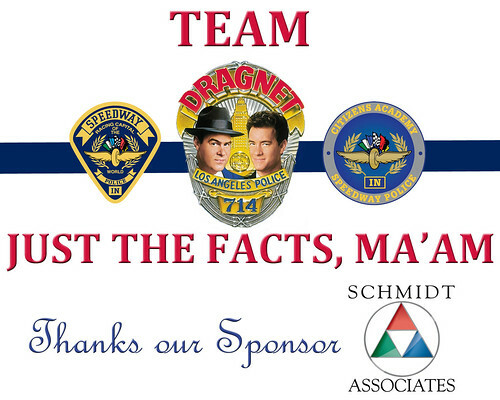 SPD and SPCAAA will partner as Team Dragnet: Just the Facts, Ma’am – in homage to our chosen movie, the 1987 feature film Dragnet, starring Dan Aykroyd and Tom Hanks. Relay for Life is a 24 hour fundraising event, which helps the American Cancer Society fight the nation’s biggest health concern, cancer. Teams can fundraise online, on site or both in a variety of ways. As in the past, we will offer the very popular Jail & Bail! We hope you’ll come out to Relay and enjoy something from all of the participating Relay teams, who will offer a variety of items ranging from crafts to food. Thank you very much to our sponsor, Schmidt Associates for donating to Team Dragnet! Here are some highlights from Speedway’s Relay for Life event. On Saturday, February 13, 2016, the Speedway Lions Club hosted the annual State of the Town Address, held in the Media Center at the Indianapolis Motor Speedway. In addition to summaries of the various Town of Speedway departments, including Parks, Streets, Infrastucture, Schools, and Fire Department, Speedway Town Council President David Lindsey spoke about the effort and commitment of the Speedway Police Department to the safety of the town, highest standards of policing practices, as well as the continued strengthening of partnership with residents. I personally believe that the key to the quality of life begins by keeping our residents safe. Our emergency services have consistently risen to the challenge of protecting our residents, businesses, and investments in our community. Our police department was recognized by the Commission on Accreditation for Law Enforcement Agencies as an accredited police department. This recognition places our police department among the select police departments in the United States that have best police practices. Of the over 17,000 police departments in the United States, only 581 are CALEA accredited and our police department is one of those departments. 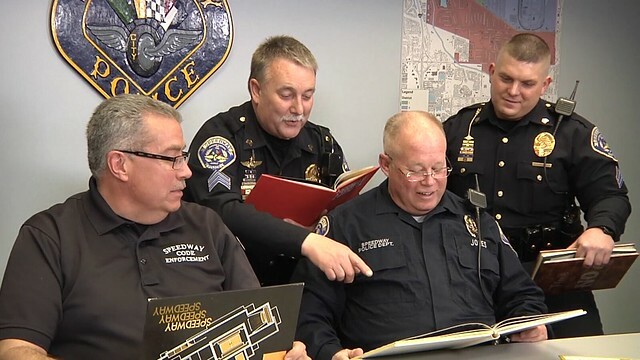 We see other instances around the country where there is strife between the community and police; but in Speedway, our police department is part of our community, and as a group professionals charged with a challenging and often dangerous job, they have willingly accepted the challenge to adopt the highest standards of law enforcement. Speaking of engaging citizens and police, the department’s Volunteers in Policing services has done just that. The V.I.P. program utilizes graduates of our outstanding Citizens Academy to assist in special public safety assignments including special event security and traffic control. Would all of the graduates, instructors, and volunteers of our Citizens Academy please stand and be recognized at this time. Thank you. In 2015, this partnership between the community and our police department extended to our high school as well. The outstanding leadership in Speedway schools and the Speedway Police Department created the first Student Academy to foster strong relationships between the next generation of leaders in our community and our leaders in law enforcement. We accomplished all of this while serving as the lead law enforcement agency for three international sporting events and 62 special events in the community. Make no mistake, our emergency service professionals face challenges each day. To assist in the challenging environment that they must operate in, we have invested in the infrastructure that allows our team to stay informed. We have improved cameras at intersections and in our parks, adopted a policy that will allow the police department to replace the oldest squad cars in the fleet and we’ve partnered with other agencies to utilize data and mapping technology to be more proactive. We believe that by fostering strong partnerships in the community and taking decisive action to deter and arrest criminals, we will continue to protect the investments that we have made in this community. Our Code Enforcement Division took on the challenge of developing recommended updates to the Town’s Municipal Code. This is no small task when you consider that the code in some instances was nearly 90 years old. These policy changes added a much needed review of the necessity of many of these antiquated laws while also recommending policies that make our neighborhoods stronger and safer. I greatly appreciate Joe Kramer’s efforts to help us not only enforce the Municipal Code, but also to find ways to strengthen it. Thank you Joe. In addition, the 2015 Year in Review video is shown at the end of the State of the Town Address or you can view it separately below. The video contains clips of so many of the great events, construction, and development in Speedway. Among them is our 2015 National Night Out event, as well as the graduation for the latest Citizens Academy Class!